Google Maps have launched a Mario update to coincide with Super Mario Day which sees the Nintendo icon drive alongside you. Super Mario Day is today, March 10 (i.e. MAR10), a day which celebrates the most iconic character in video game history. Mario first burst onto our screens back in 1981, and since then has become one of the most recognisable pop culture icons around. To celebrate the loveable Italian plumber, who has been entertaining us for 37 years, Google has launched an awesome Google Maps update. The new feature sees the Nintendo hero follow you around in a Mario kart on Google Maps while you're getting directions for a drive. Announcing the new feature in a blog post, Google Maps UX Engineer Munish Dabas said: "We know a true Mario fan when we see one. "They hum the Super Mario Bros. background music on repeat, daydream about collecting gold coins and 1-UP mushrooms, and want nothing more than to traverse the Mushroom Kingdom with Luigi, Toad, and Yoshi to rescue Princess Peach from Bowser. "To celebrate our favorite mustachioed plumber-turned-racer on his special day—MAR10 Day—we’ve collaborated with the team at Nintendo to let Mario accompany you on all of your driving adventures on Google Maps this week." To start with, you'll need to update your Google Maps app from the Google Play store or the Apple App Store. Then, set the destination you're going to and choose the car journey option, which is indicated by the vehicle icon. At the bottom of your screen you'll see three icons - with the third from the left being the question mark icon seen in many Nintendo games. Click on that and it'll turn yellow and a new screen will pop up saying "Oh yeah! Mario time!" In the Google blog post, Munish explained what happens once the feature is enabled. He said: "Once enabled, you’ll see that the navigation arrow has morphed into—who else?—Mario. "He’ll be a constant companion wherever you’re driving this week—to work, to school, or the spaghetti house. "Just remember to practice safe driving on the road—we don’t encourage throwing bananas or red shells at other drivers in real life!" The Google Maps Mario update went live on Friday across the global and will be available for a week. 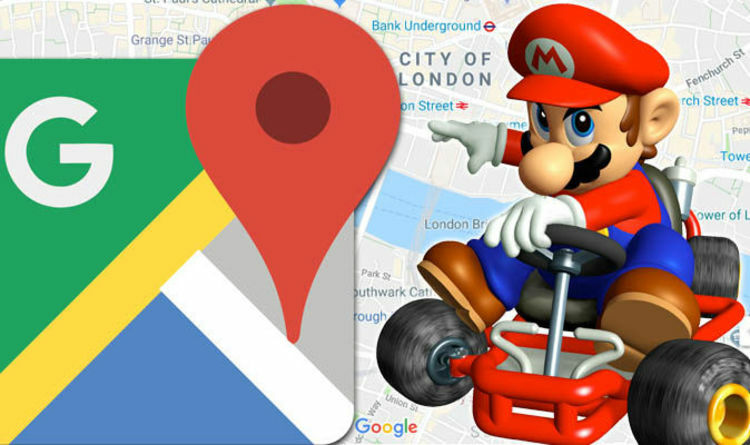 Google are encouraging Google Maps users to take a screenshot of their route with Mario and share it with @GoogleMaps on Twitter and Instagram with the hashtag #MarioMaps. However, the search engine giant warned users not to share personal details like their home or work address in the pictures they put on social sites.